This user guide describes how to deploy Acumos platforms using the “One Click deploy” tools designed for developers or those who want a simple and automated way to deploy an Acumos platform. Currently deployment supports an all-in-one (AIO) target. The AIO deploy tools build an all-in-one instance of Acumos, with the database, Nexus repositories, and docker containers all running on a single virtual machine or physical host machine. oneclick_deploy.sh: the main script that kicks off the deployment, to setup an AIO instance of Acumos under a docker or kubernetes environment. acumos-env.sh: environment setup script that is customized as new environment parameters get generated (e.g. passwords). Used by various scripts in this toolset, to set shell environment variables that they need. Post-install, you can get various passwords from this e.g. mysql root and user passwords if you want to do any manual database operations, e.g. see what tables/rows are created as part of Acumos deployment. clean.sh: script you can run as “bash clean.sh” to remove the Acumos install, to try it again etc. docker-compose.sh: Script called by the other scripts as needed, to take actions on the set of Acumos docker services. Used by oneclick_deploy.sh and clean.sh for docker-based deployments. You can also call this directly e.g. to tail the service container logs. See the script for details. openssl.cnf: OpenSSL configuration file used in self-signed certificate generation. peer-test.sh: Automated deployment of two AIO platforms, with federation and demo model onboarding. Used to test federation use cases. create-peer.sh: Automated setup of a peer relationship between two Acumos AIO deployments. Used by peer-test.sh. create-user.sh: Automated user provisioning and role assignment. Used by peer-test.sh to create users for model onboarding, and portal admins for testing federation actions on the Acumos platform. bootstrap-models.sh: Model package onboarding via curl. Optionally called by peer-test.sh. docker-compose yaml files for all system components to be deployed or otherwise acted upon via docker-compose.sh. each Acumos host is an Ubuntu 16.04.x desktop/server, with at least 16GB of RAM (recommended). The Acumos platform as deployed by this script on bare metal consumes currently about 6GB of RAM, so may be deployable in hosts with less than 16GB RAM. 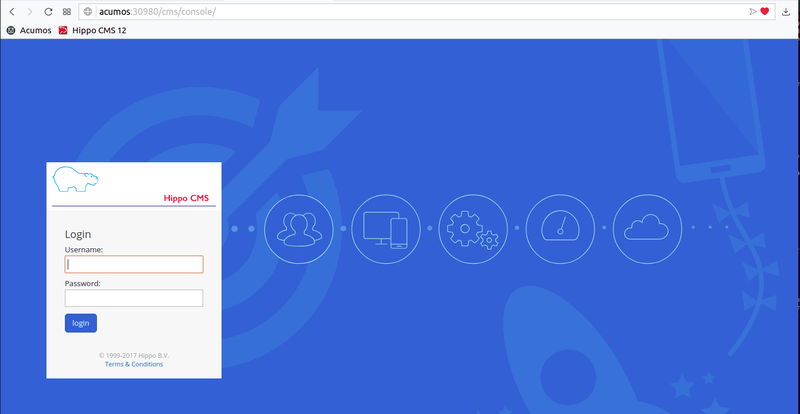 that have a hostname resolvable by DNS or through the hosts file of whatever machine you use to interact the Acumos web portal (referred to here as the “portal”) and platform APIs such as onboarding and federation. The notes below provide an overview of the installation process. See Verified Features below for a summary of what’s been verified to work in the test environments where this has been used. The script will preserve an existing database and all the related credentials (MariaDB, Nexus, CDS, …) during the deployment, if the ACUMOS_CDS_PREVIOUS_VERSION variable is set. This will also be supported for database upgrade in a coming version (the capability is developed, but not fully tested). If you are deploying a single AIO instance, run the following command, selecting docker or kubernetes as the target environment. Further instructions for running the script are included at the top of the script. The deployment will take 5-20 minutes depending upon whether you have run this command before and thus docker has already downloaded the Acumos docker images. That will speed up subsequent re-deploys. When the dialog closes, you should be able to see a new node “AIO” under hst:hosts. You can now your changes by pressing the Write changes to repository button in the upper right. Update your local workstation’s hosts file so the portal domain name “<hostname>” will resolve on your workstation. Add a line: <ip address of your AIO host> <hostname>. Note: on Ubuntu, the hosts file is at /etc/hosts. The example below is from an Ubuntu laptop with the AIO instance running in a Virtual Box environment. If you get a browser warning, just accept the self-signed cert and proceed. As described in Install Process and Stopping, Restarting, and Reinstalling, you can redeploy the whole platform without losing current data (e.g. users and models), by changing the values in acumos-env.sh (as updated by an earlier install process) as needed, leaving the rest as-is, and re-executing the deployment command you used for the previous deployment. However, this process is not guaranteed to be fail-proof, and if you are concerned about the ability to recover database items that may be lost, it is recommended that you first backup the databases or export data from them. Some tools have been developed for this, e.g. components can be upgraded, e.g. for testing or to move to a new release assembly. However, ensure that you have addressed any component template changes, as described by the release notes for the new component versions. CDS version changes sometimes result in a new version of the CDS database schema. Version upgrades are supported by the AIO toolset, given that there is an available mysql upgrade script in the common-dataservice repo. 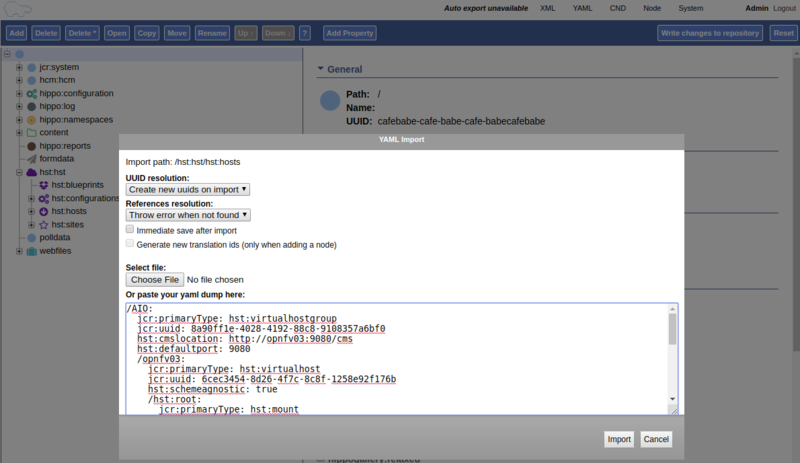 Scripts are provided for an incremental update only; see the CDS github mirror for examples of the available scripts. The following Acumos platform workflows and related features have been verified as working so far. This list will be updated as more workflows are verified. A test script to automate user account creation and role assignment has been included in this repo. See create-user.sh for info and usage. For an example of this script in use, see Federation. oneclick_deploy.sh will automatically create a “self” peer as required by the federation-gateway. peer-test.sh: installs and peers two Acumos AIO instances, on two hosts, and optionally uploads model packages via curl. create-peer.sh: used by peer-test.sh. You can call this script directly to add a peer to an existing Acumos platform. If you have not created an admin user, run create-user.sh as above to create one. This indicates that the request for “solutions” was accepted. “…” will either be “” (no solutions) or a JSON blob with the solution details. Logs are easily accessible on the AIO host in the /var/acumos directory. These host folders are mapped to persistent volumes exposed to the components. To use a non-default domain name for the acumos AIO server (default: acumos), change ACUMOS_DOMAIN in acumos-env.sh, and use the chosen domain name in the “Install Process” above, in place of “acumos”. You can install multiple Acumos platforms (e.g. to test federation), just be sure to give each a unique domain name as above. The latest verified Acumos platform docker images are specified in acumos-env.sh. This script will be updated as new versions are released to the staging or release registries of the Acumos.org nexus server.